I am the voice behind Lekha Washington and Kanagana Ranaut, respectively. Dhaam Dhoom was a brilliant time because it was more or less the same team as Unnale Unnale and the same dubbing studio. The only thing that was discordant was the absence of Jeeva sir. Jeyamkondaan was another beautiful experience. The director of the movie, Mr Kannan was previously the associate of Mani Ratnam sir. Dubbing can be physically tiring a lot of times, which is why, there are more instances of my turning down opportunities. And the instances of my asking "Why me"?. There are very exceptionally talented dubbing artistes who are brilliant and which is their sole career option. Like in any artistic field, the onus has always been on finding freshness. My voice, I should say has been quite the stumble-upon, as long as dubbing is concerned. I have never thought that I had the typical girl's voice. Its common knowledge that my speaking and singing voices are poles apart. When I walked in for Sillunu Oru Kadhal, I think I was given to understand that they wanted a "sophisticated, educated" voice. Whatever that meant. I told them that I ll try just for the heck of it, 'cos I don't have the laughter of babbling brooks or a voice that sounds, well, feminine. I am more of the tomboy in some cases. And then Unnale Unnale happened. And then Satham Podadhey. These were the times I realized the amount labour that goes into making a movie. How easy it is to walk into a theatre, spend the bucks, buy the popcorn and the give a verdict as we walk out. Dubbing sessions were when I realized what it is to be on the other side of the screen. And to be able to work with the directors is a brilliant learning experience too. Their thought processes and how they shape a certain expression to come out in someone else's voice to convey an idea. Its beautiful to be part of the whole thing. Amidst a lot of laughter, some tears, screaming if the character demands it, pulling each others legs and several cups of tea dubbing sessions are wrapped up. Tiresomeness hits only after a while. But the studio engineers are extremely sharp and they can spot tiredness in the voice immediately. A break happens there or the remaining scenes would be postponed to another day. Usually they don't push a tired voice since the next step will be strain and then a total break until the voice recuperates. Normally sessions like these take about 3-5 days. But not the entire day in each case. A few hours in each. Guess this works best both ways. Having different people come in to speak different roles gives the needed creative break and work gets done in the same time perhaps. Several times I have wondered about things I ought to have had. About the way somethings should have turned out. And a few people that I have come across. But then as I was driving home today after a recording session - the song was an extremely fulfilling one -I was thinking that these are times that I must remember again, to count my blessings. That I am offered opportunities again and again on varied levels to try out and figure out the things. But never waste an opportunity to learn. I guess if I am getting these, so does everyone else. And if everyone out there can grab every opportunity that presents itself, work on it for whatever it is worth, I am sure it would be complete use of this time that we have called life. Here is wishing, for you, who are reading this space, that you get enough and more opportunities, to grow, change, evolve, those which can shift and change perspectives and sometimes toss up your insides, so that, you know what it is like to have new eyes. Or maybe, just, a new way of seeing, watching, observing. And may you also have the grace and reckless abandon that makes you take the step forward to work on the present. Chinmayi, In the end..Delivery matters. No matter how much someone struggles to make a movie, or the hardship involved, afterall the movie maker knows the target audience..and it really does not concern the viewer;how hard it takes to make a movie..
All that matters is whether it was good or not. :)) And yeah, ur singing n speaking voices r quite apart but both r truly awesome. I loved ur dubbing style n voice for tanisha in Unnale Unnale. Ummm, no girl, ur voice is extremely feminine esp when u sing. and u still don't know that huh? hehe, kidding !! But really, u r just outstanding ok!! but i always wondered do dubbing artists actually burst out crying when they dub for such scene? cos, i think the dubbing voice is wot brings out the real emotion behind the scene n not only acting. and it is wot gives the soul to action! a real talent. phew! hard job! equally as acting!! anyways, Good lucksssssssss to youuuuu!!! i wonder sometimes why some people don't give their full effort while doing any task or work, as u said everything is worthwhile.i got so many instances for this. even i did some mistakes like this a hectic conditions.the only thing matters here is concentration. SOK , U gave voice for Jothika? You are experiencing your life so well I guess. Have a blessed life always. Thanks once again. 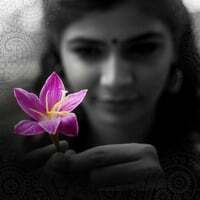 It's been sometime since i visited ur blog.. missed the last ten posts, i shud say..
Gawd, this is one famous blog, i should say..
Chinmayi, brilliant post. You have explained how dubbing works for people like us to understand. Fantastic. Wish you lot of success and happiness. Stay blessed. PS: Going to watch Dhaam Dhoom today. Can't wait ! I read one of your posts in your Blog called “Train of thoughts”, it was impressive. I have always wondered about the capabilities of human mind to conceive and perceive things. Everyone knows that our experiences are dependent on our perceptions, some one ponders on his past (like thinking about the collage days or school days) and can relive his past with the power of his mind and can really experience his past, in the same way he or she can also think about his or her future and their perceptions gives them an experience it might be of joy or regret it doesn’t matter but they experience something, whether it be about our thoughts pertaining to past or future we experience something, then why do we call the thoughts of past and the experience that it brings along with it as real or in the sense acceptable and the experiences pertaining to our thoughts about future as fantasies when both are based on the perceptions ? i thought u gave voice for bhavana in jayam kondan. i watched Dham Dhoom on friday and i came to your space to ask you if u were the voice behind kanaga renault, and you were. i think your voice added flavour to the character.it was really good. I am learning from you that...after reading your astute articles...It'll be great if i get a chance to meet you!!! You clearly explained the job behind the voice dubbing. Normally most of us don't know about that(Inclding me). This film not released in delhi.So I can't make comments about that but in Sillunu Oru Kadhal your voice is perfectly matched. havent watchd both d movies yet bt am sure u must ve done a gr8 job. so did u n unnale unnale..ur voice matchd tanisha's bubbly charac v.well..
nd offcourse evry job has its pros n cons.. n so is dubbing r singing r wateva. but most imp is hw d end-product turns out to b. ppl do respect gud work these days nd tats y even movies like subramaniapuram tat hits d theatres unheralded is critically acclaimed. hope dis continues in future too. neenga dubbinglam vera poreengala!!! wow..everyday wen i tune into aha fm..it wud be the time u wud be signing off and the chinnamapla team pitches in..correcta nenga "have a safe journey and godspeed gud people" solrathuku login aaiduven :D it feels refreshing to start the day witha gud wish :) of all ur interviews the one u did with director Seeman from US(?) was the best :D he was very comfortable in clean tamil and you struggling each time :D was fun to hear..
Nice post.You have explained how dubbing works for people like us to understand better. I think ur voice suits well for Kangana Ranaut. Nice advice in the end, Chinmayi. You related your experience to it very well. Why do the folks in Tamil moviedom address other personalities as Rajini sir or Kamal sir? This is a colloqial form of respect I haven't heard anywhere else in the world. Addressing them as Mr. Rajini/Kanth or Mr. Kamal/Hassan is no less respect than Rajini saar or Kamal saar. Anonymous: because they are senior and highly respected.. Bollywood says Ji instead.. why dont you accept for what they are? Its not necessary that people have to follow things on someone's behest all the time, Honestly. this is the norm here.. the younger generation doesnt address one another as sir and madam. FYI. That said, a lot of people address them as "Mr" in public gatherings too.. Some say ayya, appa .... Different people, different styles. U r voice for kangana ranaut is gorgeous yar. At very first dialouge of her i identified ur voice. nice, keep rocking !!! Thanks for sharing ur experience and for your wishes as well. "Here is wishing, for you, who are reading this space, that you get enough and more opportunities,... change perspectives and sometimes toss up your insides, so that, you know what it is like to have new eyes... grace and reckless abandon that makes you take the step forward to work on the present." - The best I liked about the whole Blog. Now you are becoming the sweet voice of our tamil heroines. When you did for Dhanisha (unnale unnale), every one become addict. God gifted you the great asset. My wish is this: you would be a popular singer and should grab a number of national awards. why dont, you deserved to be! I think you are very lucky that you had the opportunity to pursue what you like and fortunately take it up as your career. I mean, many of us have to struggle just to get to the point where we can say 'Ah this is what I want in life'. ...let alone pursue and excel in it. I know some of my friends who have voice that sounds like gentle sounds of tinsels, like bells ringing...but life circumstances did not take them to polish their talent. Wonder where they would all be if the actually took a different path in life. By the time we identify the thing that matters the most, majority of the time is lost and then we find ourseves neck deep in other commitments that it takes a mountain climbing effort to actually pursue the thing that matters the most. I am sure opportunities are always around us but truly how many of us can really afford to take the one that we want? At some level we are forced into things that we may "like" and not really "love"?? Only passion can bring excellence. So in that sense I think you are blessed. (I mean, you are passionate about singing and fortunately you were not forced to pursue something else). Not sure, if any of this makes any sense at all...but I thot I'd just voice out my immediate response to your post. Hi Chinmayi, we've been watching Super Singer for the past couple of seasons. Watching the current one too and wanted to ask you about one thing. Why do you sign off every show saying Godspeed or Shabba Khair? Just curious as we felt that in a tamil show, most of the target audience might not even know what those words mean. Wow Chinmayi, You've bowled me over again, with this post. -those who cant grab the opportunities that they get, not because they dont want to, but for lack of freedom to do so. -those that grab the opportunities, but dont give their best shot. -those that grab the opportunities, put their heart into it without fear of failing. I believe that you were very fortunate in being allowed to follow your heart at a young age and that has set you apart(some thing I keep bringing up all the time). But then its your attitude (which shows up with your singing, writing) of going forward with "grace and reckless abandon" and giving your very best that's made you successful. You deserve every success in life. good luck!